Ronno has been on my (not so short) list of artists-I-have-heard-but-want-to-get more-into for some time. 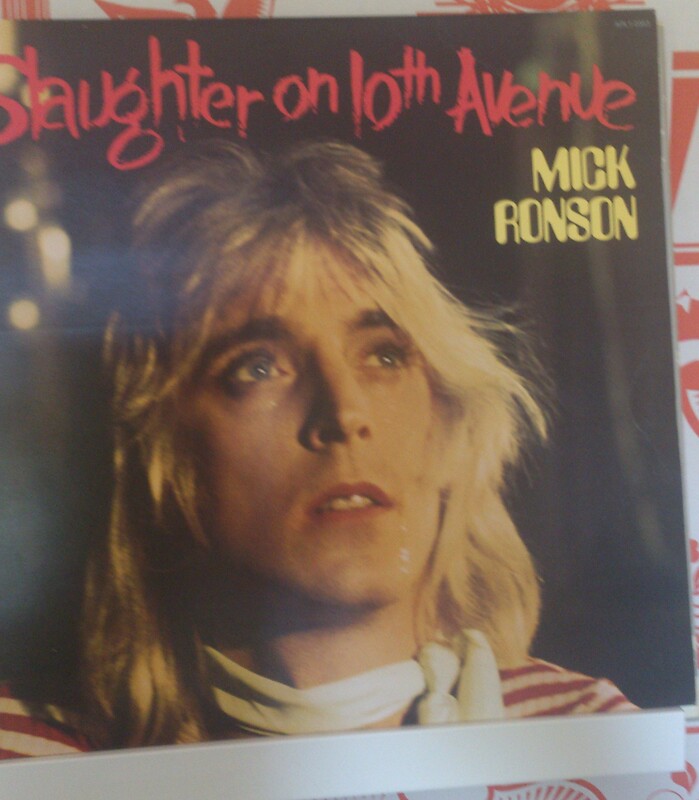 So, when the discerning record digger finds a copy of Slaughter on 10th Avenue wedged between a crate of books and a table le at the Sunday marketg, no faffing about. Of course, the record is rattling about in the cover without an inner sleeve, and of course, it is suitably grimy, but not scratchy. So a deal of 10 kronor (around 1€ or £1, currency fluctuation notwithstanding) is struck. After cleaning up, it’s not a top copy, but a reasonable play copy. Mick arranged and played on Bowie’s 70-73 albums, including Ziggy. Three song credits to Bowie. Recorded with the Pinups lineup of Bolder, Dunbar, Garson. Managed by Bowies MainMan setup. Mick’s vocal style is similar to the main man in Ziggy mode, but the range is not comparable. Overall, you get a feeling of outtakes from the Bowie camp. Love Me Tender does no do that much to me, I’m not even that much into it with Elvis, and here it is over-exploited. Maybe something that works in a live setting. The song that gets to me is Music Is Lethal, end of side one. Verse is Mick on vocals and guitar, and chorus is full orchestral arrangement, built up like an early Scott Walker song.